Home Asia Singapore Who Put the "Ang Mo" in "Ang Mo Kio"
Who Put the "Ang Mo" in "Ang Mo Kio"
The purpose of this entry, is in fact to explore the history behind the naming of the heartland 'new town' of Ang Mo Kio in Singapore (similar to a suburb in many western cities). My office is located in Ang Mo Kio, hence the reason for my interest in this matter. According to Wikipedia, Ang Mo Kio is "a heartland new town located in north central Singapore, and is generally within the North-East Region. It has a town centre and six neighbourhoods. Although containing many of the common features of the island nation's neighbourhoods, e.g. hawker centres, wet markets and HDB housing blocks, residents see the town as retaining a distinctive identity. Singapore's Prime Minister, Lee Hsien Loong is the Member of Parliament for this constituency. 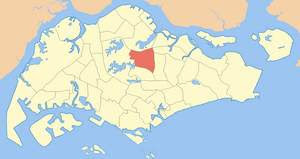 As an urban planning division, the Ang Mo Kio Planning Area lies within this region." The name is believed by many people to come from the Hokkien term "Ang Mo Kio" (红毛桥), meaning "Westerner Bridge". The term "ang mo" (literally "red hair") is often regarded as a somewhat derogatory Hokkien reference to the caucasian people who settled from the West and, because such a name could be be considered unflattering, it is now written as 宏茂桥 which is pronounced almost the same way, but translated, means "Bridge of Expansiveness and Prosperity". Some local people have incorrectly assumed that the new version of the name refers to the bridges at the seventh milestone of Thomson Road (found at the junction of Ang Mo Kio Avenue 1 and Thomson Road). These two old bridges were known as Or-kio ("black bridges") in the local spoken dialects. Research suggests that neither of these bridges were officially named, but they spanned the canal and the old Kallang River forming a link to the Pierce Reservoir. The actual source of the name comes from the old survey maps which label the land as "Mukim of Ang Mo Kio" (Mukim meaning "area" or "district" in Malay). The word "Ang Mo" 红毛 may in fact not refer to Westerners. Rather, it is derived from two separate combined phrases in Hokkien. Ang Mo Dan means "rambutan" 红毛丹, a local fruit, red and covered in hair, found plentifully around the areas of old "kampongs". Likely the second suffix "kio" 桥 ("bridge" or "bridges" in Hokkien) was added to the prefix "Ang Mo" 红毛 as an additional description to indicate a more precise location that residents would recognize i.e - 红毛桥. There were many concrete bridges built by the old kampong dwellers. It first appears on the early maps drawn by surveyors who took those two phrases and combined them to form "Mukim of Ang Mo Kio" ("District of Ang Mo Kio"). The actual location of Ang Mo Kio New Town has been also known by the former name Kou-teu kio, Hokkien for "Ninth Bridge". 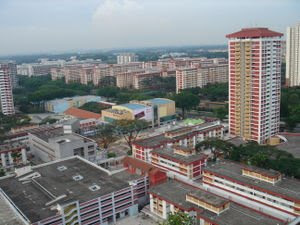 Ang Mo Kio Avenue 10 is at the eastern part of the town Ang Mo Kio. It encompasses the Ang Mo Kio Neighbourhood Park, Chong Boon Secondary School, Pathlight School, Chong Boon Market and Food Court, Ang Mo Kio Industrial Park 1 and Teck Ghee Community Centre. The numbering system of the Ang Mo Kio Avenues is that the even number avenues (such as Ang Mo Kio Avenue 2) are oriented in the north-south orientation and the odd number avenues in the east-west orientation. Ang Mo Kio Avenue 2 is in the western part of the town. Ang Mo Kio Avenue 3 is in the southern part of the town. My office is located in Ang Mo Kio Street 64, in Ang Mo Kio Industrial Park 3. The much-awaited AMK Hub has finally been built. Part of the plan to redevelop and to create vibrancy in the town centre of Ang Mo Kio. Both the NTUC and bus interchange have moved from the corner of Ang Mo Kio Avenue 8 and Ang Mo Kio Central 3 to the AMK Hub. Hehe - I don't know about much agriculture in AMK... I think we import most of our fruit and veges in SG now don't we? OMG. this blog is so interesting! I live close to ang mo kio. lol yup veges are imported now. Coz orchard road used to have orchards in that area. Was trying to associate the tomatoes~~~ but I don't know AMK's agriculture past at all so yeah hahaha. what is so offensive about "Ang Mo"? ?